Welcome to Denver Law’s Legal Externship Program! 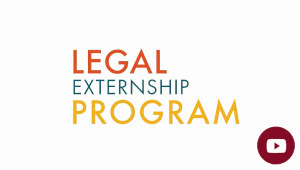 Legal externships specifically refer to monitored hands-on legal and law-related work experiences in which the placement is outside of the law school (versus working in an in-house clinic or as part of a lab with a faculty member). Explore our website to learn about the student experience pre, during, and post externships, and review our student handbook for more detailed information.